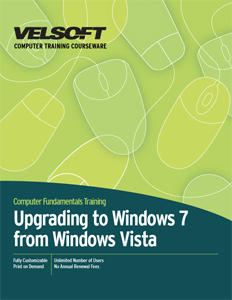 This training courseware title provides everything you need to professionally deliver Upgrading to Windows 7 from Vista training including editable training manual, hands-on exercises, exercise files, detailed instructor guide, classroom-ready PowerPoint slides, and unlimited online learning licensing. Seeing is Believing This sample manual to teach Upgrading to Windows 7 from Vista is in MS Word format. Ensure that upgrading from Windows Vista to Windows 7 is seamless. Properly plan and execute the upgrade. Properly train your students. Like our customizable training courseware, Windows 7 has many features. Both were built with the user in mind. We want your workshop to be successful. We want to make you look good. That is why we made sure that our training material was prepared by professional, on staff writers. Don't waste your time creating lesson plans. Use your time wisely. Use the training material that we provide: everything is already done for you. Our customizable courseware training material is built for trainers. You can simply print and train or you can modify any of the curriculum to better fit your style and needs. For example, you can inserting your own logo and name to brand it as yours. However, you choose to edit - or not - the material, when you print the workshop material and stand in the classroom you can do it with confidence. Our all-in-one downloadable course material is complete; covering all of the skills and topics that you expect. It includes: Lesson plan, student workbooks, training strategies, learning activities, case studies, and many more valuable tools to help you be amazing! Try your free customizable demo today!